In gastric and gastroesophageal junction (GEJ) cancer, human epidermal growth factor receptor 2 (HER2) overexpression has become an important selective biomarker for treatment with trastuzumab (Herceptin®, Roche/Genentech). The gene for the HER2 protein (also known as ErbB-2, c-erbB2, or Her2/neu) is a proto-oncogene located on the chromosome 17q. This gene encodes a 185-kDa transmembrane tyrosine kinase receptor protein, which is a member of the HER family that consists of HER1 (EFGR), HER2, HER3, and HER4. HER2 forms both homo- and heterodimers and serves as a critical dimerization partner for other members of the HER family, and leads to activation of downstream signaling pathways associated with cell proliferation, differentiation, survival, and angiogenesis. Amplification of the HER2 gene and overexpression of HER2 in gastric cancer was first described in 1986[3-5], and since then a large number of studies has confirmed these findings. Gastric cancer is the fourth most commonly diagnosed cancer and the second most common cause of cancer-related death worldwide. Despite some advances in the prevention and treatment of the disease, the 5-year survival still remains around 20%-25% in most parts of the world. Although the incidence of gastric cancer is declining, the prognosis for the disease remains poor. The poor survival rate is mainly explained by the advanced stage of the disease at the time of diagnosis. If screening for gastric cancer was performed, as in Japan, the tumors could be detected at an earlier stage and thus surgical resection performed, which has shown to increase the 5-year survival significantly. When the disease becomes metastatic the treatment is largely palliative, and different combinations of chemotherapy have resulted in a median overall survival of 8-10 mo. Based on data from the ToGA trial, trastuzumab, in combination with chemotherapy, was approved in 2010 for treatment of patients with HER2 overexpressing metastatic gastric or GEJ cancer, and thus became the first targeted anti-cancer drug for treatment of this serious disease[10,11]. This short review will discuss HER2 status as a prognostic and selective biomarker in gastric and GEJ cancer, as well as current and future HER2 directed therapies. Different slide-based assays are available for the detection of overexpression of the HER2 protein, which is measured by immunohistochemistry (IHC), or amplification of the HER2 gene, which is measured by fluorescence in situ hybridization (FISH) or other ISH methods. 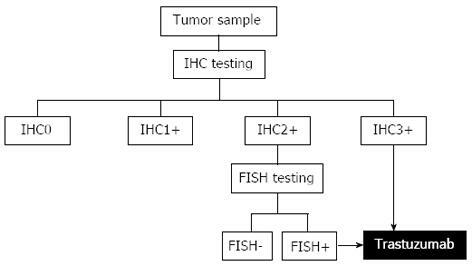 Examples of a positive HER2 status by IHC and FISH are shown in Figure 1. Due to differences in tumor biology, HER2 testing in gastric cancer differs from breast cancer. The gastric cancer tissue more frequently shows HER2 heterogeneity and incomplete membrane staining, and as a consequence of this a specific gastric cancer testing protocol has been developed[12,13]. 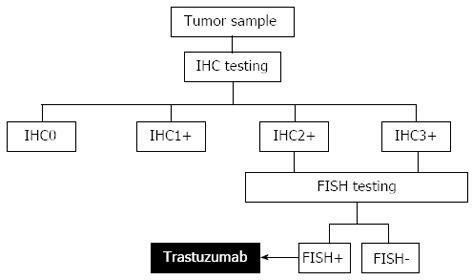 Based on the results from the ToGA trial, which will be discussed later, IHC is the primary test in gastric and GEJ cancer, with FISH being used as a reflex test in cases of an equivocal IHC2+ result. In Table 1 are shown the interpretation and scoring guideline for the HercepTest™ (Dako), which, together with the HER2 FISH pharmDx™ Kit (Dako), are the only companion diagnostic assays that are currently approved by the United States FDA in relation to testing of gastric and GEJ cancer patients for whom treatment with trastuzumab is under consideration. The reason for this is that these two assays were those used to select the patients enrolled in the ToGA trial. As HER2 positivity in the ToGA trial was defined as being either IHC3+ or FISH+ and both tests were performed on almost all patients, the United States FDA requires that both assays are used in order to determine the HER2 status. Table 1 Interpretation and scoring of human epidermal growth factor receptor 2 immunohistochemistry for gastric cancer, as approved by the United States Food and Drug Administration in relation to the HercepTest (Dako). Figure 1 Human epidermal growth factor receptor 2 positive gastric adenocarcinoma. A: Immunohistochemistry (HercepTest™, Dako); B: Fluorescence in situ hybridization (FISH) (Human epidermal growth factor receptor 2 FISH pharmDx™ Kit, Dako). The prevalence of HER2 overexpression in gastric cancer varies a lot from study to study. In a larger literature survey based on 11860 patients from 38 individually published studies, the calculated weighted mean was 17.9% (95%CI: 14.8-20.9). The corresponding range for these studies was from 4.4% to 53.4%. This survey also looked at HER2 amplification; however, here the number of patients was somewhat lower. The prevalence estimate was based on 1597 patients from 8 different published studies and the calculated weighted mean was 12.2% (95%CI: 9.5-14.8). The corresponding range for these studies was from 8.7% to 18.1%. The explanation for the large variation found in the HER2 positivity rate for the IHC studies is likely to be multifactorial, and here the difference in the populations studied may play a role. However, the most important factor is probably the use of non-standardized assays using different antibodies and the application of different scoring and interpretation criteria for the stained slides. In the screening program related to the ToGA trial, 3807 patients were screened, which makes it the largest single study conducted on the prevalence of HER2 positivity in gastric and GEJ cancer. This program showed an overall HER2 positivity rate of 22.1%, although with a large variation from country to country. The highest prevalence rate (33.2%) was found in Australia and the lowest (5.9%) in Taiwan. A number of studies have shown that HER2 overexpression and amplification are related to the Lauren histological classification, with higher levels found in the intestinal phenotype compared to the diffuse and mixed types[6,11,15-21]. This was also confirmed in the ToGA screening program, where the HER2 positivity rate was found to be statistically significantly (P < 0.001) higher in the intestinal phenotype (32.2%) compared to the diffuse (6.1%) and mixed (20.4%) types. Furthermore, the degree of HER2 overexpression seems to vary with the location of the carcinoma, with higher expression in the proximal part and the GEJ compared to distal parts of the stomach[21,22]. Again, the ToGA screening program confirmed this observation with a HER2 positivity rate of 33.2% when the cancer is located in the GEJ, compared to 20.9% when located in the stomach. Again, this difference in HER2 positivity related to tumor site was statistically significant (P < 0.001). A few studies have also shown that the expression of HER2 increases with disease progression[23-26]. The ToGA trial must be characterized as a landmark in the treatment of gastric cancer. Following the successful completion of the study, trastuzumab, in combination with chemotherapy, became the first targeted drug to be approved for this indication. The study was designed as an open labeled, randomized multicenter phase III study in HER2-positive patients with histologically confirmed inoperable locally advanced, recurrent, or metastatic adenocarcinoma of the stomach or GEJ. 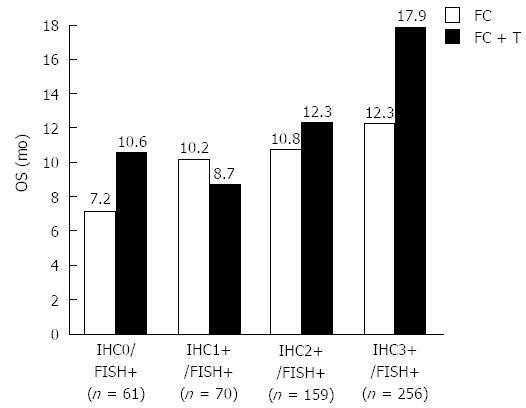 HER2 positivity was defined as being either IHC positive (3+) or positive by HER2 FISH (HER2/CEN17 ratio ≥ 2). However, both an IHC and FISH test were performed on almost all patients. After inclusion in the study, patients were randomized to receive chemotherapy (5-FU or capecitabine and cisplatin) or chemotherapy plus trastuzumab. More than 3800 patients were screened for the study and 584 of these were randomized. The primary endpoint in the study was overall survival (OS), with secondary endpoints including overall response rate (ORR) and progression free survival (PFS). For the primary endpoint, the combination of chemotherapy plus trastuzumab was shown to be statistically superior to chemotherapy alone. The median OS increased from 11.1 to 13.8 mo (P = 0.0046), with a hazard ratio (HR) of 0.74 (95%CI: 0.60-0.91). The secondary endpoints of ORR and PFS showed superiority in favor of the combined treatment with chemotherapy and trastuzumab. The overall tumor response rate was 47% in combined treatment with chemotherapy and trastuzumab, compared to 35% in the group with chemotherapy alone. A pre-planned exploratory analysis looking at the effect in the different HER2 IHC categories (0, 1+, 2+, 3+) showed that the survival benefit provided by trastuzumab seemed to be dependent on the level of HER2 protein overexpression. The single subgroup of patients with the greatest survival benefit was the one with a HER2 test result of IHC3+. Here, the median OS increased to 17.9 mo for the group treated with the combination of trastuzumab and chemotherapy compared to chemotherapy alone, which achieved an OS of 12.3 mo. Overall, the survival gain for the group of patients with IHC3+ expressing tumors was nearly 6 mo. The HR for this group of patients was 0.58 (95%CI: 0.41-0.81). 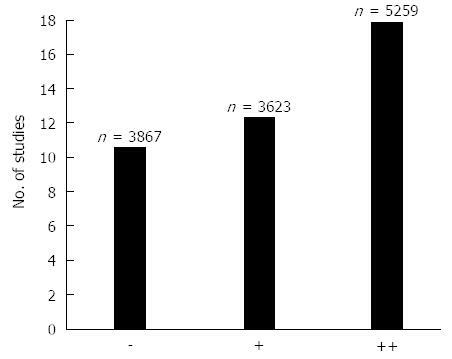 The results of the subgroup analysis for the different IHC scores are shown in Figure 2. Figure 2 Median overall survival in months for the four individual human epidermal growth factor receptor 2 immunohistochemistry scores for the two treatment groups. OS: Overall survival; FC: Fluorouracil/capecitabine plus cisplatin; FC + T: Fluorouracil/capecitabine plus cisplatin plus trastuzumab; FISH: Fluorescence in situ hybridization; IHC: Immunohistochemistry. Based on the information from the pre-planned exploratory analysis, a post-hoc explorative analysis was performed on a subpopulation of the originally included patients. This population comprised the patients who were IHC3+ positive or IHC2+ positive, and those who were FISH positive. A total of 446 patients fulfilled these criteria, and the median OS for the group of patients who had received chemotherapy plus trastuzumab increased to 16.0 mo compared to 11.8 mo for the patients on chemotherapy alone. The HR for this analysis was 0.65 (95%CI: 0.51-0.83). The median follow-up for all the patients in the ToGA trial was reported to be 17.1 mo. Concerning the selective properties of the two HER2 companion diagnostic assays, explorative analysis showed that the IHC test should be used as the primary test for selection of patients for treatment with trastuzumab. As shown in Figure 2, the effect of trastuzumab seems to be dependent on the degree of HER2 protein overexpression, with the best median OS in the group of patients with IHC3+. Furthermore, when looking at the HER2 test results for the patients enrolled in the ToGA trial, the agreement between overexpression of the HER2 protein and amplification of the gene is found to be somewhat lower in gastric cancer than that normally observed in breast cancer. A relatively high number of HER2 FISH positive cases were found among the IHC0 and IHC1+ tumors as shown in Table 2[10,11,27]. Based on the subgroup analyses in the ToGA trial, a specific HER2 testing algorithm was developed as shown in Figure 3. However, since nearly 95% (533/584) of the patients enrolled in the ToGA trial had tumors that were HER2 amplified, it has been argued that the criteria for treatment with trastuzumab should be both gene amplification and protein overexpression. In relation to the approval of trastuzumab for treatment of advanced gastric cancer this was, in fact, the position taken by the United States FDA, who recommended that reflex testing with FISH should be considered for both IHC2+ and IHC3+. An algorithm taking this into consideration is shown in Figure 4. A recent survey made in the United States also showed that FISH reflex testing was performed for both IHC0 and IHC1+ at some cancer centers. So, despite recommendations from both scientific and regulatory sides there still seems to be no real consensus with respect to which testing algorithm to use. Table 2 Positive human epidermal growth factor receptor 2 status by immunohistochemistry and/or fluorescence in situ hybridization for the patients enrolled in the ToGA trial[10,11,27]. N: Number of patients. HER2: Human epidermal growth factor receptor 2; IHC: Immunohistochemistry; FISH: Fluorescence in situ hybridization. Figure 3 Human epidermal growth factor receptor 2 testing algorithm developed based on the results of the ToGA trial. Immunohistochemistry (IHC) is the primary test with reflex testing with Fluorescence in situ hybridization (FISH) in case of an equivocal IHC result (IHC2+). 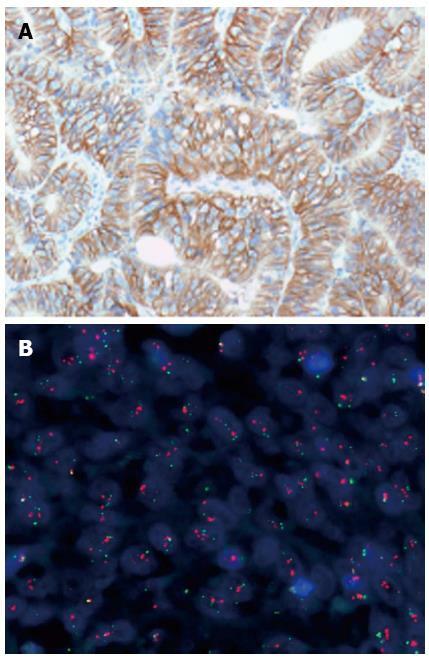 Figure 4 Human epidermal growth factor receptor 2 testing algorithm with fluorescence in situ hybridization reflex testing for both immunohistochemistry 2+ and immunohistochemistry 3+. This testing algorithm was recommended by the United States Food and Drug Administration in relation to approval of trastuzumab for advanced gastric cancer. FISH: Fluorescence in situ hybridization; IHC: Immunohistochemistry. As described above, the primary analysis of the ToGA trial showed a median OS of 13.8 mo for the group of patients that received the combined treatment of chemotherapy and trastuzumab compared to 11.1 mo for the group that was assigned to chemotherapy alone. In the discussion section of the paper published in the Lancet in 2010, it was mentioned that the OS of 11.1 mo in the group of patients receiving chemotherapy alone was longer than expected. As a possible explanation for this, it was stated that HER2 overexpression might already be conferring a better prognosis across the groups of patients studied. However, it was also mentioned that HER2 overexpression leading to a better prognosis, is in contrast to recent studies that have showed an association between HER2-positive tumors, poor outcome, and aggressive disease. The authors further concluded that more studies were needed to address the issue of whether HER2 has an effect on prognosis in gastric cancer, and whether it confers a good or poor prognosis[6,10]. In breast cancer, HER2 was found to be a negative prognostic factor very early on, and a number of studies have subsequently confirmed this[2,29]. However, when it comes to gastric cancer there still seems to be no definite conclusion, despite the fact that the first studies demonstrating an association between a positive HER2 status and poor prognosis appeared more than 20 years ago[26,30]. In order to address this issue, a systematic analysis of data from the literature was undertaken where a large number of studies on HER2 and gastric cancer were reviewed. The studies included in this analysis should fulfill the following two criteria: 1) the number of patients in each study should be ≥ 100 and the HER2 status should have been determined either by IHC or ISH, and 2) the selected articles should include an analysis of the association between the HER2 status and survival or relevant clinicopathological characteristics. Forty-two publications with a total of 12749 patients fulfilled the two criteria and were reviewed in detail. The studies described in these 42 articles were scored according to the strength of the association between the positive HER2 status and the prognostic information reported, using a three point categorical scale. In 17 of these 42 studies (approximately 40%) an association between positive HER2 status and poor survival (++) was found, and an additional 13 studies (approximately 31%) similarly displayed a relationship with clinicopathological characteristics (+) such as serosal invasion, lymph node metastases, disease stage, or distant metastases. In the last 12 studies (approximately 29%), no association between positive HER2 status and poor survival or clinicopathological characteristics could be detected (-). Overall, 30 (71%) out of 42 studies showed an association between a positive HER2 status and poor survival and/or relevant clinicopathological characteristics. Figure 5 illustrates the number of studies and patients in each of the three scoring categories. Figure 5 The number of studies and patients (n) in each of the three scoring categories. Symbols: Two pluses (++) indicate the strongest association with the Human epidermal growth factor receptor 2 (HER2)+ status, one plus (+) indicates a somewhat weaker association with the HER2+ status, and minus (–) indicates that no associations with the HER2+ was found. Based on this analysis of the literature data, it was concluded that a clear trend towards a potential role for HER2 as a negative prognostic factor in gastric cancer was shown, which is also in line with another recently published systematic review based on literature data. Furthermore, with reference to the publication of the ToGA trial in the Lancet, the data could not support the hypothesis that positive HER2 overexpression could act as a positive prognostic factor in gastric cancer. None of the articles that fulfilled the necessary criteria in the analysis supported this hypothesis. Possible confounding factors, such as a wider use of second line treatments and a possible better prognosis related to the intestinal phenotype, should be taken into consideration when interpreting the data from the ToGA trial. With regards to the latter, it is worth mentioning that approximately 75% of the patients included in the ToGA trial had tumors of the intestinal type, which seems to be high compared to most of the studies reported in the analysis of data from the literature. This characteristic might have influenced the OS seen in the group of patients that received chemotherapy alone. In support of the hypothesis put forward in the Lancet article, one study was identified which showed that overexpression of HER2 resulted in a better prognosis compared to those who did not overexpress the protein. However, this study was not included in the analysis due to the number of patients being < 100 (thus failing one of the criteria). Here, samples from 93 patients with advanced gastric carcinoma were investigated using IHC. Overexpression of HER2 was found in 10 patients (11%), and a multifactorial analysis showed a significantly better prognosis for those patients in relation to survival. However, after the finalization of the above described analysis of data from the literature, a relatively large study has recently been published. This study comprised 381 patients, with 78 (20%) of these being found to be HER2 positive by IHC or ISH. When the HER2 status was correlated with survival data, patients with HER2 positive tumors had longer OS compared to the HER2 negative patients, however, the prognostic value disappeared in the multivariate analysis. Despite the data in gastric cancer not being as consistent as shown in breast cancer, the majority of studies seem to point towards HER2 overexpression and/or amplification as being an indicator of poor prognosis. In line with this conclusion, it has also been suggested recently that HER2 overexpression and/or amplification is a molecular abnormality that is linked to the development of gastric cancer. Following the initiation and success of the ToGA trial, a number of other HER2 targeted compounds have gone into clinical development for treatment of gastric, esophageal, or gastroesophageal junction cancer. These compounds represent small molecule tyrosine kinase inhibitors (TKI) and antibodies, as well as antibody-drug conjugates (ADC). Most of these compounds, together with the stage of development, are listed in Figure 6. However, in this review, emphasis will be placed on the drugs that are further advanced in clinical development (phase II and III). An overview of these compounds and their targets are given in Table 3. Phase I compounds will only be described briefly. Table 3 Overview of the phase II and III compounds and their targets. TKI: Tyrosine kinase inhibitors; mAb: Monoclonal antibody; ADC: Antibody-drug conjugate. Figure 6 Drugs targeting human epidermal growth factor receptor 2 in clinical development for treatment of gastric, esophageal, or gastroesophageal junction cancer. The individual compounds are listed according to the stage of development. As is the case for the other phases, the compounds in phase I clinical development can be divided into small molecule inhibitors and antibodies. According to ClinicalTrials.gov there are two small molecule pan HER inhibitors, ASLAN001 (Aslan Pharmaceuticals) and HM781-36B (Hanmi Pharmaceuticals), in phase I. When it comes to the antibodies, two compounds are in phase I development, the HER2 monoclonal antibody MGAH22 (MacroGenics) and the bi-specific antibody MM-111 (Merrimack Pharmaceuticals) directed towards HER2 and HER3. Dacomitinib (PF-00299804, Pfizer) is an oral pan-HER TKI. The compound irreversibly inhibits HER1 (EGFR) and HER2 tyrosine kinase, as well as blocking HER1/HER2, HER2/HER3, and HER3/HER4 heterodimerization[36,37]. In different preclinical models, dacomitinib has shown significant growth-inhibitory effects in HER2-amplified gastric cancer cells, such as SNU-216 and NCI-N87. Furthermore, the combination of dacomitinib with chemotherapeutic agents (such as 5-FU and cisplatin) or targeted agents (such as trastuzumab) showed a synergistic effect. However, a clinical phase II study in HER2 positive (IHC3+ or FISH+) patients with advanced gastric cancer, where dacomitinib was given as monotherapy, showed a response rate of only 7.4% and an OS of 7.1 mo. The relatively modest clinical effect may be explained by the advanced stage of the disease and that the patients had been heavily pretreated. Afatinib (Gilotrif, Boehringer Ingelheim) is another oral irreversible pan-HER TKI that targets HER1 (EGFR), HER2, and HER4. The compound has recently obtained FDA approval for first-line treatment of patients with metastatic non-small cell lung cancer whose tumors have tested positive for EGFR mutations. The FDA has also approved therascreen EGFR RGQ Kit (Qiagen), a companion diagnostics assay, for use in the detection of EGFR exon 19 deletions or exon 21 substitution mutations. In relation to gastric cancer, afatinib has demonstrated antitumor activity in a HER2 positive xenograft mouse model. Additionally, results from a small clinical phase II study in HER2 positive patients with esophagogastric (EG) cancer has recently been presented. Based on data from this study, the investigators concluded that single agent afatinib showed clinical efficacy in patients with trastuzumab refractory EG cancer. However, this conclusion must be regarded as preliminary, as it was only based on data from 7 patients and more patients are expected to be enrolled in the study. Lapatinib (Tyverb/Tykerb, GSK) is an oral TKI, but, in contrast to both dacomitinib and afatinib, its inhibitory effect on HER1 (EGFR) and HER2 is reversible. Lapatinib is currently approved for treatment of HER2 positive metastatic breast cancer in combination with capecitabine (Xeloda, Roche) or for HER2 positive postmenopausal women with hormone receptor positive metastatic breast cancer in combination with letrozole (Femara, Novartis). The antitumor effect of lapatinib has been investigated in different gastric cancer cell lines, and it was shown to induce a selective and potent growth inhibition in the two HER2-amplified gastric cancer cell lines SNU-216 and NCI-N87. Furthermore, in the same model lapatinib combined with 5-fluorouracil, cisplatin, oxaliplatin, or paclitaxel showed an additive or synergistic effect. These results provide the rationale for the clinical development of lapatinib for the treatment of HER2-positive gastric cancer. A phase II clinical trial was performed in patients with unresectable gastric adenocarcinoma, although in this protocol HER2 positivity was not an inclusion criterion. A total of 47 patients were enrolled in the study and 44 received lapatinib as monotherapy until disease progression or unacceptable toxicity. The response rate was relatively modest with 5 patients (11%) having a confirmed or unconfirmed partial response. The median OS was 4.8 mo (95%CI: 3.2-7.4). Data from the LoGIC phase III trial where lapatinib plus chemotherapy (capecitabine and oxaliplatin) was compared to chemotherapy alone in patients with HER2 positive advanced gastric, esophageal, or gastroesophageal junction adenocarcinoma has recently been presented. The median OS for the lapatinib plus chemotherapy group was 12.2 mo compared 10.5 mo for the group that received chemotherapy alone. The primary endpoint for the study with regards to HR for OS was not reached (HR: 0.91, 95%CI: 0.73-1.12, P = 0.35). The response rate was 53% for the combined group receiving lapatinib and chemotherapy, compared to 40% for the group receiving chemotherapy alone. However, a pre-specified subgroup analysis in Asian patients and patients < 60 years showed a significant improvement with a HR of 0.68 and 0.69, respectively. A total of 545 HER2 positive patients were randomized in the LoGIC study. Another phase III clinical trial, TYTAN, in Asian patients with advanced gastric cancer is still ongoing. In said study, patients with HER2 amplified tumors are randomized to lapatinib plus paclitaxel or paclitaxel alone. Based on the clinical data presented so far, the future role of lapatinib in gastric cancer must be regarded as unclear. Pertuzumab (Perjeta, Roche/Genentech) is a humanized monoclonal antibody that binds to sub-domain II of the extracellular part of the HER2 protein, thereby blocking its ability to form heterodimers with other members of the HER family, including HER1 (EGFR), HER3, and HER4. Trastuzumab also binds to the extracellular part of the HER2 protein, albeit to a different sub-domain (IV), and it does not possess an inhibitory effect in relation to dimerization of HER2 with the other HER receptors[48,49]. Pertuzumab has a mechanism of action that is complementary to that of trastuzumab, and the combination of these two monoclonal antibodies has been demonstrated to be effective as a first-line treatment in metastatic breast cancer. This has recently led to regulatory approval of the compound for treatment of HER2 positive metastatic breast cancer in combination with trastuzumab and docetaxel. In gastric cancer, a tumor mouse xenograft model using the HER2 positive NCI-N87 cells has been used to demonstrate the preclinical antitumor activity of pertuzumab. Based on this model, a significantly enhanced antitumor efficacy of pertuzumab in combination with trastuzumab was shown compared to monotherapy with each of the two compounds. Similar antitumor efficacy was shown using another HER2 positive cell line (4-1ST), thus paving the way for the clinical development of pertuzumab in gastric cancer. Both clinical phase II and III trials in HER2 positive metastatic gastric or gastroesophageal junction adenocarcinoma have been initiated, which include the large international JACOB study. In this study, pertuzumab plus trastuzumab and chemotherapy (cisplatin, 5-FU/capecitabine) are compared to placebo plus trastuzumab and chemotherapy. It is planned that the JACOB study should enroll 780 patients at approximately 200 sites in 35 countries worldwide[52-54]. Ado-trastuzumab emtansine (Kadcyla, Roche/Genentech) is a novel ADC specifically designed for the treatment of HER2-positive cancer. It is composed of the potent cytotoxic agent DM1 (a thiol-containing maytansinoid anti-microtubule agent) conjugated to trastuzumab via a specific linker molecule. Ado-trastuzumab emtansine binds to the HER2 protein (sub-domain IV) with an affinity similar to that of trastuzumab. It is hypothesized that after binding to the receptor protein, ado-trastuzumab emtansine undergoes receptor-mediated internalization, followed by intracellular release of DM1, which then exerts its cytotoxicity in the tumor cell. Ado-trastuzumab emtansine has been compared with lapatinib plus capecitabine in a phase III trial in HER2-positive breast cancer patients with metastatic disease. Although these patients had previously been treated with a taxane and trastuzumab, the study showed that ado-trastuzumab emtansine significantly improved PFS and OS compared to the combination of lapatinib plus capecitabine. Following the successful completion of phase III, ado-trastuzumab emtansine has recently been approved for treatment of patients with HER2-positive metastatic breast cancer who have previously received trastuzumab and/or a taxane. In gastric cancer ado-trastuzumab emtansine has been tested in a number of different preclinical in vitro and in vivo HER2 positive cell models. Using the NCI-N87 and OE-19 cells lines in vitro, ado-trastuzumab emtansine was found to be more effective than trastuzumab. In a mouse xenograft model using the same cell lines, a similar positive anti-tumor effect was found in vivo. In another preclinical study, ado-trastuzumab emtansine showed pronounced antitumor activity in vivo in two other HER2 expressing cell lines (SCH and 4-1ST). Furthermore, the effect of combining ado-trastuzumab emtansine with pertuzumab has also been investigated using NCI-N87 xenografted cells, and here the combination showed a significant antitumor effect, whereas the use of the individual compounds as monotherapy did not. Additionally, the positive preclinical findings led to the initiation of a clinical development program, and currently a phase II/III trial has been initiated in order to evaluate efficacy and safety of ado-trastuzumab emtansine compared to taxane treatment in patients with HER2-positive advanced gastric cancer. The ToGA trial must be regarded as a landmark, not only did the study show that trastuzumab is effective in treating HER2 overexpressing gastric cancer, but it also gave us important information on the pathophysiological characteristics of the disease. As a consequence, HER2 testing of patients with advanced gastric cancer and treatment with trastuzumab has now become standard in most countries. The ToGA trial also demonstrated that overexpression of HER2 in gastric cancer possesses selective properties in relation to treatment with trastuzumab in a similar manner to what is known from breast cancer. When it comes to prognostics properties there still seems to be some discussion about the value. However, a recent large systematic analysis of data from the literature showed a clear trend towards a potential role of HER2 as a negative prognostic marker in gastric cancer. Hopefully, future additional data will clarify this issue. Despite the controversies around the prognostic properties of HER2, there seems to be much more consensus regarding the importance of the receptor as a therapeutic target in gastric cancer. A number of new compounds targeting HER2 and other members of the HER family are under development, and several of these have already reached phase III clinical studies. Pertuzumab and ado-trastuzumab emtansine, as well as some of the small molecule pan HER inhibitors, might be potentially useful for HER2 positive gastric cancer patients that have developed resistance to trastuzumab. I would like to thank Dako Denmark A/S for their permission to use the microscopic gastric adenocarcinoma images and Inge Merete Hounsgaard for her excellent linguistic support.